We are hashing out each of these three distinct content areas in a three-part blog series on “Innovation and The Art of Implementation.” Part 1, which discusses the “Big Ideas” of Implementation, posted earlier. This blog on the “People Aspects” of Implementation is Part 2 of the series. Check back on this blog soon for Part 3, covering the “Process” of Implementation. 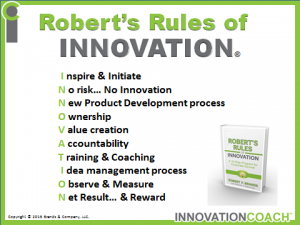 To recap, in Part 1 of this blog series, we highlighted the key points of the original Robert’s Rules of Innovation, a business entrepreneurship and innovation book. This timely and easy-to-read corporate survival guide presents the best practices for today’s “innovate or die” world, in the form of 10 imperatives your business must include to achieve growth through innovation. Create an innovation mantra for your company (and stick to it! ): The best innovation mantras inform a company’s everyday decisions and are actionable statements of intent. Be on the lookout for innovation assassins (and then counter them as they arise): Innovation assassins are barriers to both making your innovation culture stick and your plan for implementing innovation success. The best way to counter these assassins is to: (1) acknowledge their existence; (2) try to understand why they occur; and (3) reinforce an organizational culture that accepts and even encourages disruptions and risk. The reason innovation implementation can seem like an overwhelmingly daunting process is largely due to people-related issues. Such people-related issues require patience (and intestinal fortitude) as well as organizational structure to combat. A key element to implementing innovation is finding and then keeping the right people. In the past, an organization’s culture would shape its individual employees. However, today it is the value system of the individuals that collectively define the organization’s culture, value, and principles. While financial capital is necessary for implementing innovation, in today’s world, the organization that best utilizes its human capital will have the best chance of “winning” the innovation race. Top-down, bottom-up culture: Innovation (which is not itself an object, but rather a key tool used to reach strategic objectives) can only succeed if the CEO can create the delicate chemistry that results in a “top-down, bottom-up” culture of innovation. One that is rich with initiatives, engagement, and participation that includes participants at all levels of the organization. Fostering innovation must first start at the top, with the CEO also serving as the chief innovation officer who leads by example and serves as the driving force toward an innovation culture. Though at the same time, you will not be able to catalyze a full-bore innovation culture change at your organization—a process that can takes years, if it even happens at all—until your employees get comfortable with the notion that innovation is not an “add-on” to their regular job, but rather an intrinsic part of their function at work. Build your Innovation Team: Now that you’ve realized that the art of implementation requires integrated support from the top down and bottom up, it’s time to build your innovation team. To create and build the optimal team, remember that diversity is key! Your team should strive to be gender-neutral, take advantage of generational opportunities, and include a variety of profile types (as taken from the Mayo Clinic Center for Innovation’s nine general personality profile types). When building your innovation team, you should also evaluate whether communication is ongoing and clear and also whether your team embraces innovation as you do, for the long haul. Objective and Reward Alignment: In addition to lots of ongoing and clear communication, the key for a successful culture of innovation implementation is also the alignment of individual objectives and rewards. If they are not aligned, you will be exceptionally hard-pressed to achieve innovation success. You just read Part 2 of a three-part series on Innovation and the Art of Implementation. Check back on the blog soon for Part 3, which will discuss the “Process” of Implementation. 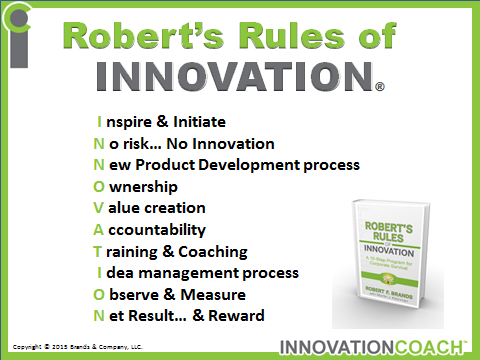 Read more about Innovation Implementation in Robert’s Rules of Innovation II: The Art of Implementation.